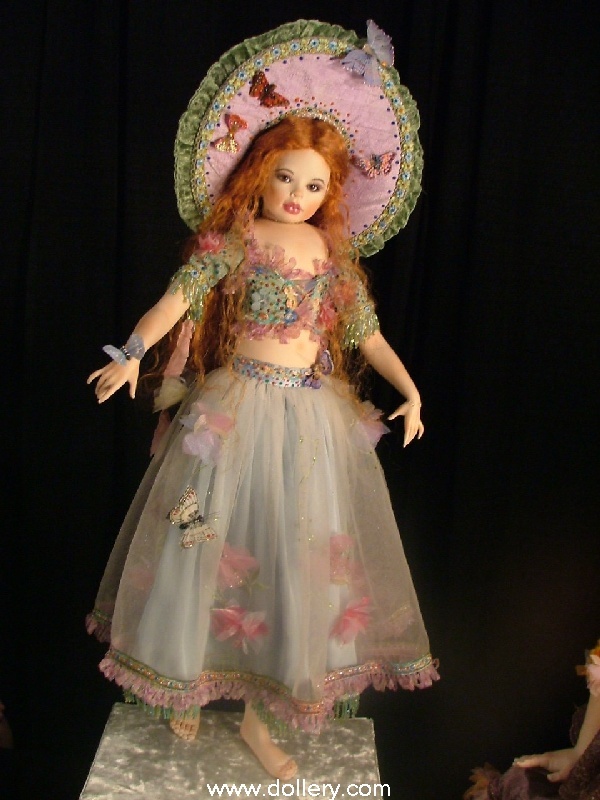 Sylvia Weser - We have carried Sylvia's beautiful dolls for many years. She has attended five of our annual doll shows in person in the last decade and she is featured here in our shop (left). Sylvia is a German artist that is world renowned for her beautiful OOAK and small limited editions (currently under 3 pieces worldwide) in porcelain. 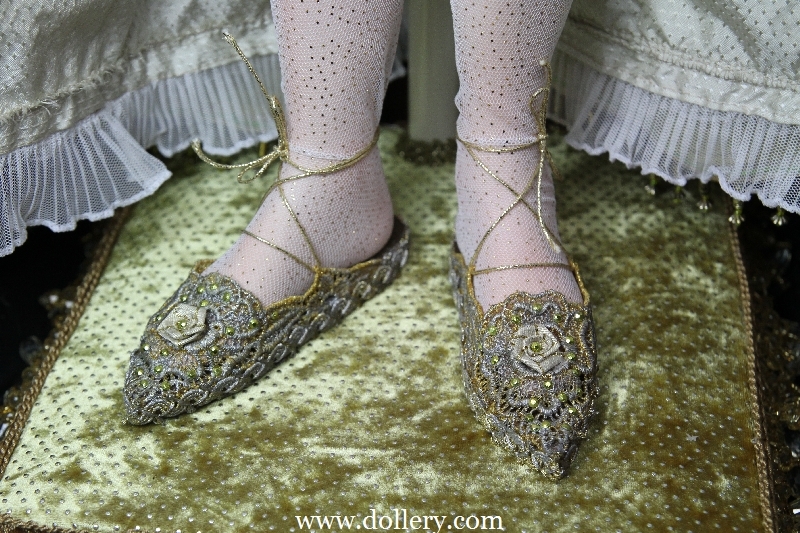 We currently have a DOLLERY EXCLUSIVE IN HER JEWEL SERIES line of dolls. She has already done "Ruby", "Aquamarine", "Diamond", "Amethyst" and she is working on "Emerald", "Saphire" and "Opal". We are currently taking special orders for specific stones of request. If you have fallen in love wtih a doll already sold be sure to contact kmalone@dollery.com for options on special ordering the doll of your dreams or getting updates on new work not shown yet here on the site. If you email your address and number we will send you our free annual doll show catalogues highlighting Sylvia's work among many others and update you automatically on new work as it comes out. Be sure though to consider ordering a doll as they generally sell out very quickly. Note - we have photos of other dolls not featured here yet on the site and more work for our Feb./March Online show including "Opal" and "Sapphire" coming soon! Chinese Princess from the opera by Puccini. Size 38" tall, white Limoges Porcelain. Very long, straight black human hair, dark blue crystal glass eyes, mouth blown in Germany. 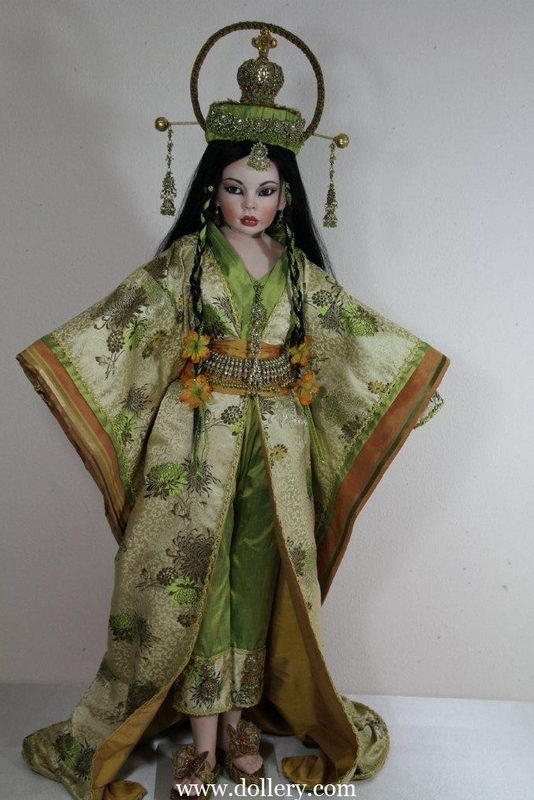 Her silk brocade Kimono style costume and headpiece is abundantly embellished with little glass pearls and jewelry. She comes with her matching stand. Retail Price: $ 9200,00 plus shipping. Emerald (below) - SOLD - This doll is part of the Dollery Exclusive "Jewel Series" - inquire about other stones being made (pre-orders being accepted) with your choice of a similar type face but not exact. Coming soon "Sapphire" and "Opal". You may special order your stone! We are accepting orders with 25% down and balance due when in. We offer EXTENDED LAYAWAY as well on her work. Be sure to contact kmalone@dollery.com for more details on what we can offer you! 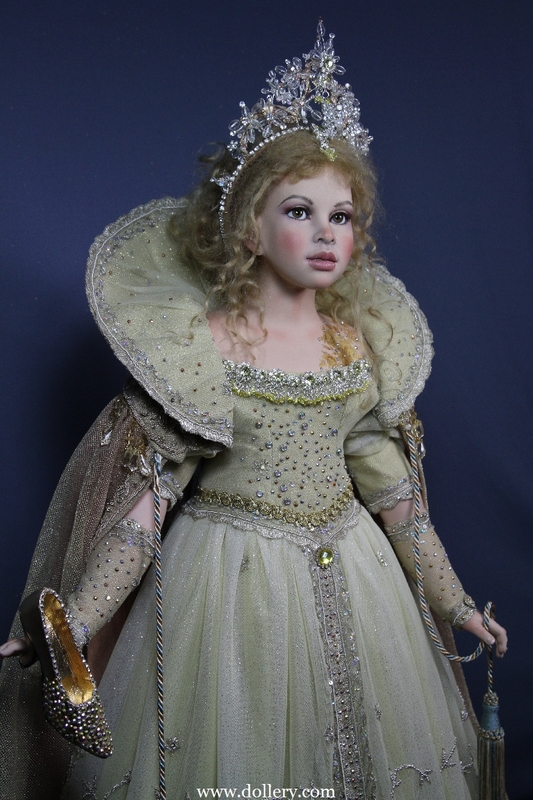 Cinderella $7,100.00 - SOLD - Inquire about custom orders for all fairytales including other versions of Cinderella. This one was a OOAK sculpt but similar sculpts may be requested. No two will be exact. 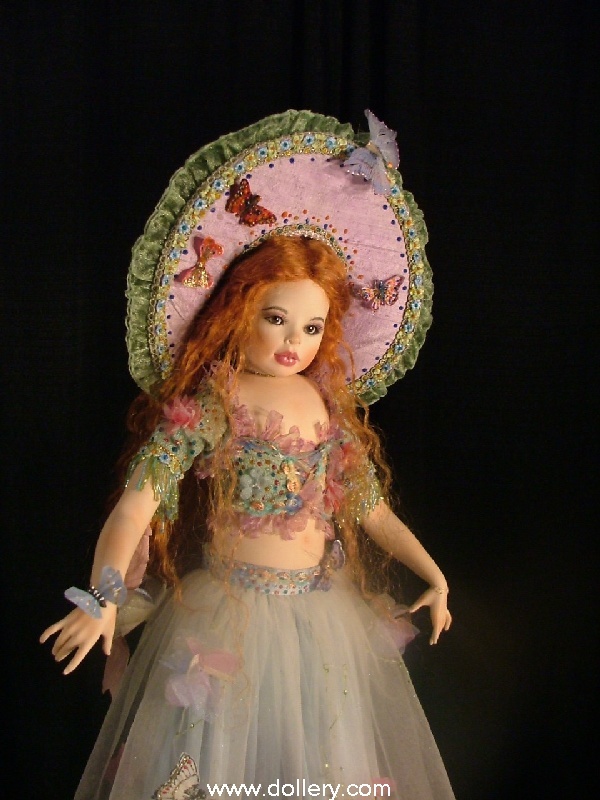 Contact kmalone@dollery.com or call 781-447-6677 ext 22 in state Ma or 800-447-Doll ext 22 outside Ma. Made from white Limoges Porcelain. She stands 35 “ including her tiara. She is a one of a kind. 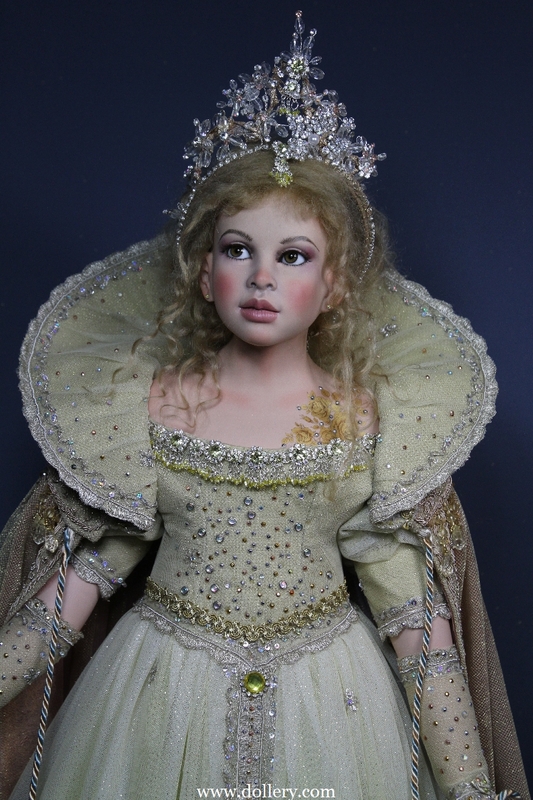 She has a honey blonde mohair wig and golden brown German mouth blown crystal glass eyes. Her gown consists of a long dress and a cape with high collar. 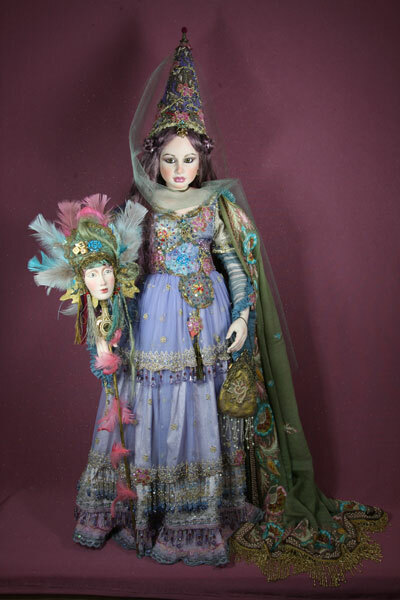 The skirt is made using three layers of exquisite antique fabrics, Dupioni silk, embroidered silk chiffon and embroidered tulle with silver metallic thread, little paillettes and crystals. Her underwear is also made from silk. She wears golden dotted white stockings. The bodice of her dress and her collar are richly embellished with Swarovski crystals in matching colours. The colour of her dress is a light lemon yellow in different shades with many sparkles shining through. Her cape is made out of a golden tulle fabric with beautiful embroidered border and is lined with an apricot silk. She comes with a beautifully decorated stand, a golden slipper and a few white doves for decoration. Please note: Sylvia had a hard time photographing the fabric on this dress. She assures us she is VERY sparkly in person. Somehow it is not coming across in the images. You can see the sparkle of her sleeve in this image below. Amethyst $9,200.00 - SOLD - This doll is part of the Dollery Exclusive "Jewel Series" - inquire about other stones being made (pre-orders being accepted) with your choice of a similar type face but not exact. This was a OOAK sculpt and costuming. Coming soon "Sapphire" and "Opal". You may special order your stone! We are accepting orders with 25% down and balance due when in. We offer EXTENDED LAYAWAY as well on her work. Be sure to contact kmalone@dollery.com for more details on what we can offer you! “Amethyst”, exclusive creation in our “Jewel” series for the “Dollery”. One of a kind, made from White “Limoges” Porcelain from France. She stands 43” including her crown. She has German mouth blown crystal glass eyes in a lavender tone, and very long, black, European human hair wig, lashes are human hair also. She has a leather body, fully poseable, armature inside. Her beautiful gown consists of different materials combined. She has three layers of very precious, richly embroidered haute couture fabrics in pink and purple. The trimmings used are decorated with many, many,…Swarowski “Amethysts” from Austria and emphasize the theme nicely. 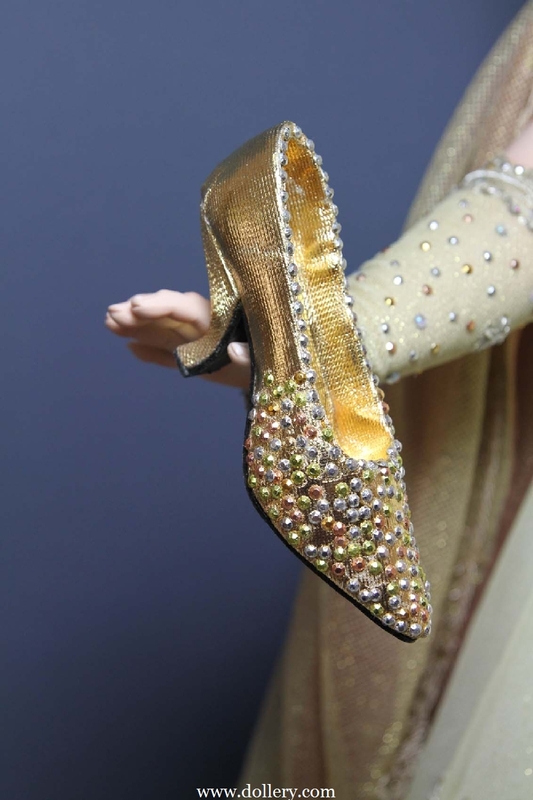 Her elegant shoes also are decorated with purple Swarowski gems. The piece comes with a matching, decoratively embellished stand and she will hold a sceptre in her hand. Diamond $9,200.00 - SOLD - PART OF THE DOLLERY EXCLUSIVE "JEWEL SERIES" - Contact kmalone@dollery.com regarding "Crystal" coming soon with similar feel but not exact. The piece is a sitting doll and comes with a matching bench. She is a one of a kind creation, measures without her headpiece 39”. Her gown is made from very precious “Haute Couture” silk fabrics and trims and abundantly decorated with “Swarowski” crystals and vintage jewellery. sure to contact kmalone@dollery.com asap if you are interested in this special series. They will all be very elaborate "jewel" themed princess dolls. Custom order requests are welcome. 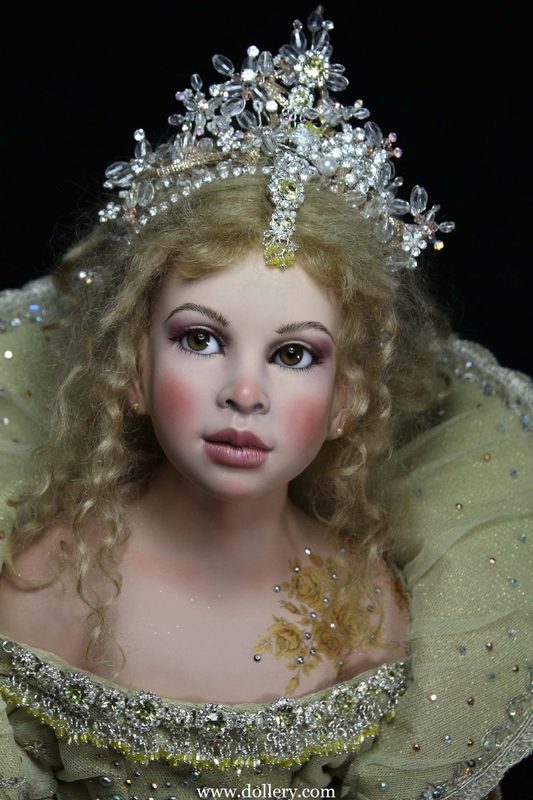 Every one of these brand new "Jewel" series dolls will have a one of a kind face and they are very reasonably priced around $6800.00 - $7,500.00 depending on the piece. A deposit of 25% is required to reserve a special "Jewel" series piece of your choice. Once the face is complete you view for approval - Sylvia aims to please on her custom orders but we always reserve the right to give her creative freedom as that is when she does her best work! If you love a certain face done in the past we can let her know the "feel" you like which will help her creative the one of a kind doll of your dreams! Be sure to contact kmalone@dollery.com asap if you are interested in her work. We also have in stock "Anna Angelina". We felt she was a great value. She is a one of a kind not an edition of three like Sylvia often does. 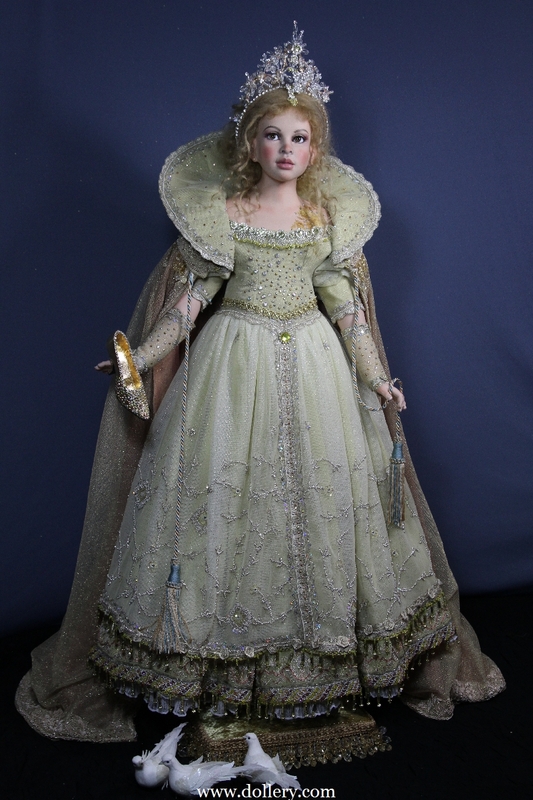 Most of her one of a kind dolls are in the $7K plus range and "Anna Angelina" is reasonably priced at $5,200.00. Sylvia participated in our 2010 doll show and participated in our 2008 and 2009 shows and personally attended our 2007 show as well as our 2006 and 2005 & 2004 shows all the way from Germany. 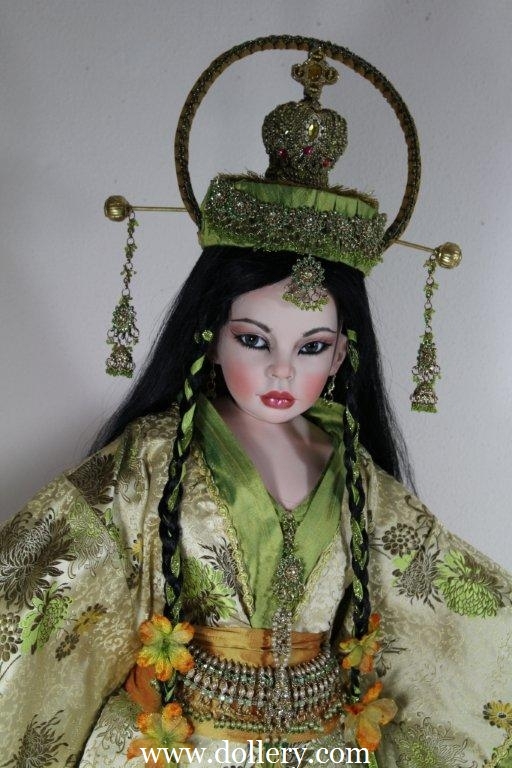 We are honored to carry this world renowned German doll artists work. 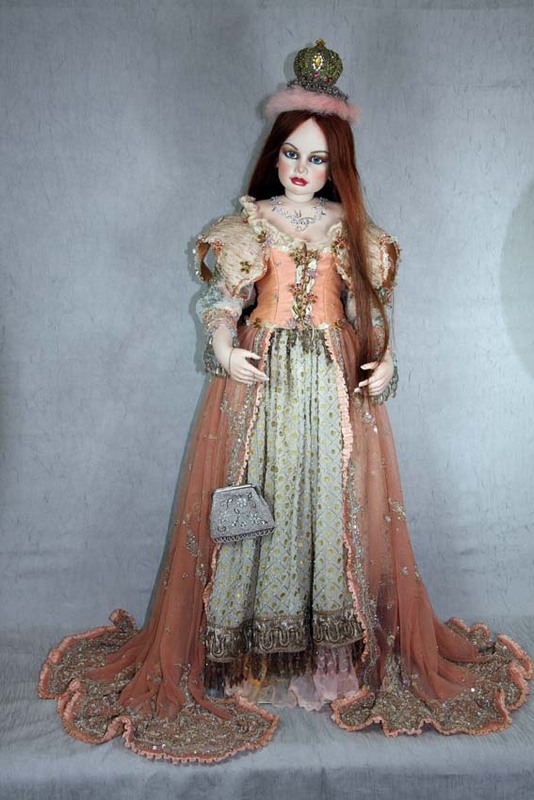 Sylvia specializes in one of a kinds and small limited edition dolls (generally under 3 pieces of a sculpt). Most editions are dressed the same; however, some editions are editions of 3 of the sculpt with one of a kind costuming. Remember, Sylvia always has other surprises for each show. For further details on Sylvia's work and her bio email kmalone@dollery.com. Love a piece that is sold shown below? Let us know. In some cases a custom order similar to a piece she has done before may be considered. You can call 800-447-Doll ext 15 out of state or 781-447-6677 ext 15 for more information. 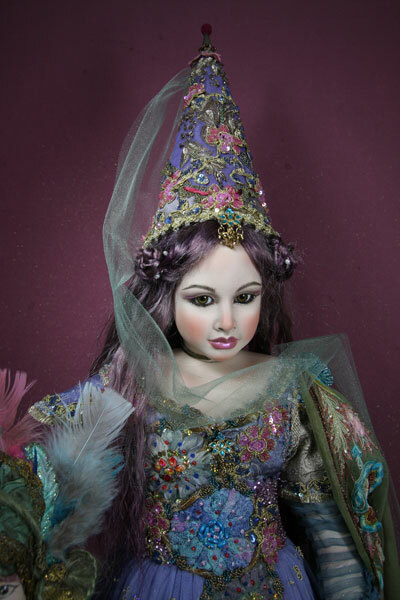 VENETIAN PRINCESS - OOAK - NEW FOR 2009 - BEAUTIFUL! $6,800.00 - SOLD - If you are interested in similar work but not exact. Contact kmalone@dollery.com on custom orders. 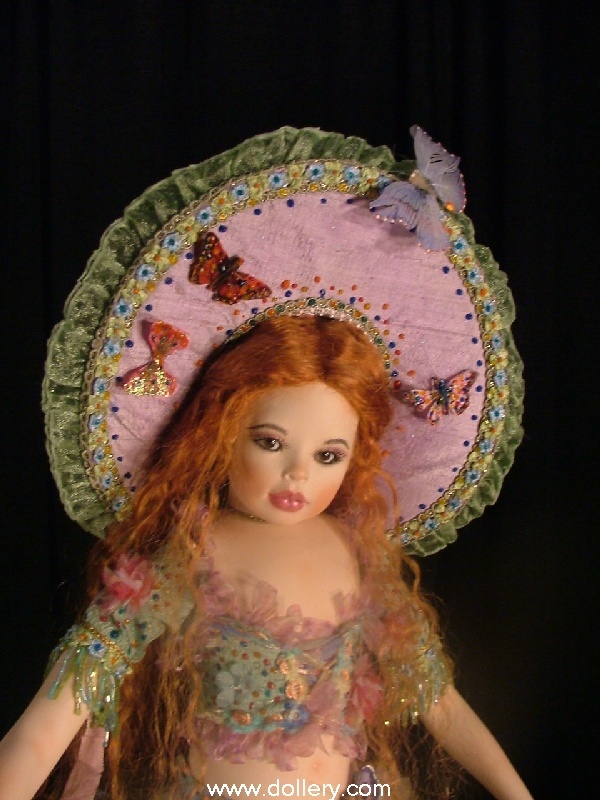 One of a Kind, Doll is 27" and 31" with hat on and stand. She is done in lavender, spring green and light blue. Gorgeous! Butterfly princess, one of a kind creation. Made from white Limoges Porcelain, curly red human hair, brown, German glass eyes. Her romantic feminine outfit consists out of a colourful bodice and a sheer, ballerina like, tulle skirt with light blue underskirt. Organza flowers, silk ribbons and beautiful butterflies embellish her spring look.